I Command You to Do As I Do! I’ve always dreamed of those robot characters in Zathura to actually think on their own. To me robots are just retarded space equipment, because they do what you do. To tell the truth thinking on your own is not that easy when you go to your brain. You have nerves and brain cells floating around and doing stuff. Back to the future kiddo, we’re not with Frankenstein anymore! This idea is known as Artificial Intelligence (AI). If you’ve played game like Halo and other sci-fi games then AI bots should be familiar to you. They are robots that can command and do things that whatever they want to do. It’s not that simple when you think about artificial intelligence. How do you make a person think in different perspective. You can’t code all the things in the world in a zeta byte or terabyte. There are so many things to learn in the world and you can’t program it all to one memory chip. To have AI, you need to see the secret behind how we think, how we talk, and how we learn. All the problems in this should be solved easily when you have the idea of what’s going around in your brain. You can’t copy the exact same blueprint of the brain and construct your own. The brain has billions of little cells that have a mind of their own to perform specific tasks. I have ideas on how to figure some of this stuff out. 1st thing that comes in mind is an autopsy. This way we can find some parts of the brain that we have never hear a and seen. What we can do after that is then figure out what it functions. For that we’ll need a volunteer. But in this same idea. We may have found all the parts in the brain and may not be able to zoom in microscopic size to see everything that we may need to see. The big big problem that we are concerned about is the obvious. It’s the money. How much money would we spend for this big project? Would it be worth it? Will we get any progress? All we can do so far is just to program robots. ASIMO was probably the biggest step in this generation with a robot that has it’s own cameras to determine what to do, where it is and send functions up to is brain to see how. To see how. That is a big step. If we can get an AI chip to get working. To see how, we’ll be able to create a robot that will be able to learn and think on it’s own. Military could use these robots to protect the people. Just imagine how useful this could be. But more robots could mean more power. If someone got the hands on the robot and changed it’s system they could do anything they could ever imagine with the robot. I don’t think that would be good, so that’s definitely off of the list. If you see this photo, you’ll laugh and be amazed at the same time. ASIMO has a short battery supply can can do various tasks and play sports. Now Toyota is in the business of robotics. 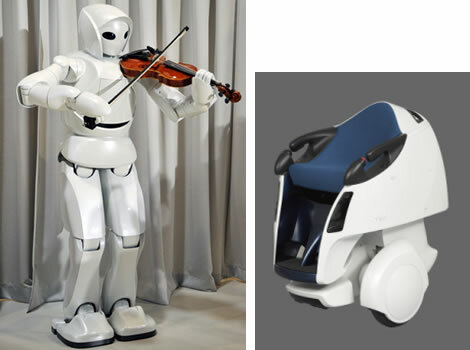 They have recently developed a robot that can carry people around when you speak to it and they have developed another robot that actually play the violin. Robots and AI have been a big idea, to do things that you want it to do, or to do as I command. Simple as it is, robots and AI are definitely the future for us. Have you ever used this Air Hogs toys? The ones that can float around when you place your hands. Those are pretty cool right? I’ve used those before and I guess my favorite one was the one that had a camera on it. You could fly around without people noticing and take a video or a snapshot. The disadvantages on those are that they have limited altitude. So you can’t be a James Bond or Alex Rider with all the cool gadget used for spying. Introducing the Robotic Swiss Quadrocopters. ETH Zurich Flying Machine Area had used the idea of embedding some tennis rackets on these robots and to allow them to have a tennis match. You can notice that these robots are competitive in one another to be the “best robot” in this tennis match. 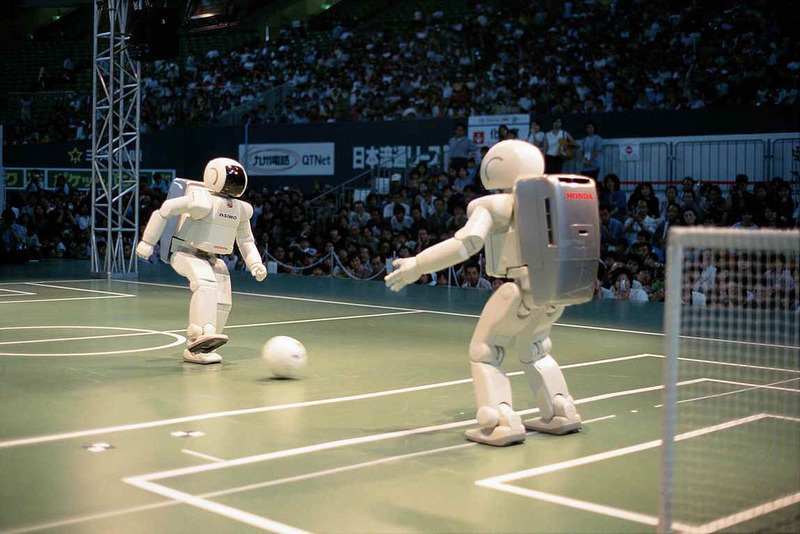 You can also see an impressive juggle by these robots. Go to:http://www.popsci.com/technology/article/2011-03/video-watch-swiss-quadrocopters-awesome-tennis-moves for more info.